Great Thurlow is a largish sleepy village to the north of Haverhill. As is usual around here, it is a very pleasant place, as if these rural parishes had sucked all the richness out of Haverhill, leaving it impoverished while they grow fat as butter. The church sits just to the east of the top road, among the biggest houses, and appeared to have been infected with their obsession with privacy, leaving visitors locked out. The porch was in pretty poor condition inside, the noticeboard hanging off and litter and dirt scattered around. The building had an air of having been abandoned, but there was a fairly new laminated notice which announced, somewhat pompously, that members of the Parochial Church Council for All Saints agree and operate a 'Locked Church' arrangement to protect its interior. I had to admire the way that the use of capitalisation and inverted commas implied that 'Locked Church' arrangements were an option discussed and agreed upon by parishes the length and breadth of England, but fortunately this is not so, and I had never come across quite such a notice before. It didn't even apologise for the church being locked. And in any case, as the insurance companies remind us again and again, locking your church is no way to protect it. 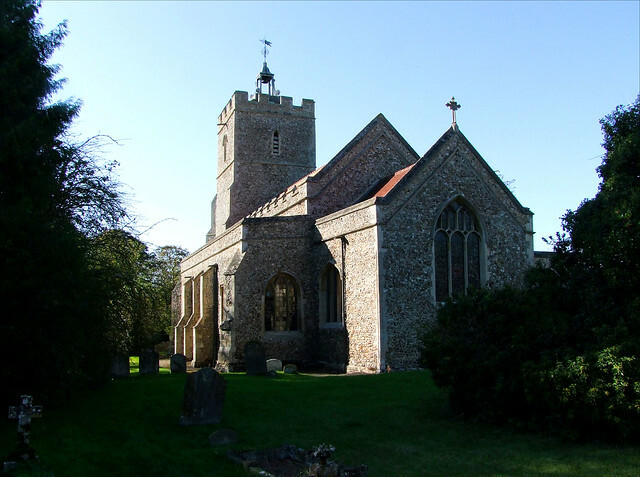 Churches which are kept locked all the time are more likely to be vandalised, more likely to be broken into and are even more likely to have something stolen from them than churches which are open every day. There is no possible excuse for it. Here, the neighbours would be effective guardians, there are no great or famous treasures, and it would be impossible to back your transit van up to the porch to remove the pitch pine furniture even if you wanted to. The only conclusion is that they don't really want people going inside, although at least they'd bothered with a notice, unlike at Little Wratting up the road.There were five telephone numbers you could ring if you wanted to discuss the possibility of access to the church by arrangement, but the day was getting on, the weather was cold, the telephone signal was poor, and, in all honesty, I really couldn't be bothered with all the fuss and suspicion by now. Far better to head on to more welcoming pastures. Here in East Anglia a good 70% of churches are open every day, virtually all the others have a notice with the location of a nearby key, and, although the area to the north of Haverhill is an enthusiastic locking area, the churches over the border in Cambridgeshire and Essex near to here are mostly open. As at Great Wratting nearby, almost everything you see on the outside is Victorian, including a mock 14th century tower which is done rather well. Some of the starkness is softened by a jaunty little vestry and chimney in the north-east corner. Inside, I understand there is a square Norman font, several brasses (they do seem to have been popular in this neck of the woods, or perhaps it is just that the 18th century antiquity collectors didn't make it this far) and a scattering of medieval heraldic glass, but pretty much everything else is 19th century or later. Although obviously I am unable to confirm any of this myself. The graveyard is some recompense, being largely unspoilt by clearances. Mortlock directs our attention to the 18th century gravestones to the west of the church, particularly that of Mary Traven. A charming little medallion shows a woman in childbirth, and the midwife trying to block out the skeleton of death by closing the curtains. Quite what was the theology of that, I wondered.